You know those directions Web sites - and the travel times they give you about how long it takes to drive somewhere? They lie! 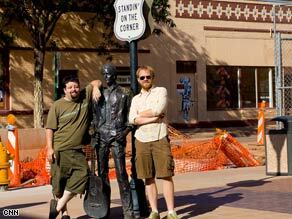 In Winslow, Arizona, Cody McCloy and co-pilot Brian Hardy visit a statue honoring the Eagles song "Take It Easy." Or at least they do when - like us - you're driving a 30-year-old vehicle, with no air conditioning and it's 100+ degrees. In addition, that's if you drive without stopping. Who drives straight for 8 hours? Not me that's for sure - as we make our way from California to Georgia. I have to eat and other such things. Also you have to fuel your car. And because we're attempting to fuel our 1978 International Harvester Scout on as much biodiesel as possible - these fill-up stops aren't always quick and easy. Today for instance, we first hit the road around 8:30 a.m. - which meant we should have arrived in Roswell, New Mexico, around 6ish. Nuh uh - we got here at 9 p.m.
We had reserved a camping spot at Bottomless Lakes State Park (which sounded divine - power, a shelter, what more could a boy and his gadgets want?) Well that was a bust. The park locks its gates at 9. We thought we might make it anyway - but a GPS-led wrong turn later and that was all a ship in the mist glimpsed but never touched. I must say Roswell is bigger than I'd imagined it, and kinda cool. The strip leading downtown has many old department stores which are now leading new lives, and a fair bit of neon. Also some of the street lights have alien eye stickers stuck on them. Yeah, I like this place. So no camping - and there seems to be a run on hotels. So neither did I get to stay in the one with the awesome neon sign. Instead it's a big corpprate box place - by far the nicest place we've paid to stay this trip. Call me what you will for wanting a little character. Okay - time to put down the blogging pen and take up the editing pen. I have a lot to do before going to bed (and crew call is at 5ish tomorrow) including finding some food, editing and uploading some video and pictures. I have been going to Roswell, New Mexico since I was a boy. It's a great town with lots of culture and history. I agree with Cody, Roswell is cool and the Alien culture that inhabits its streets definitely adds to nuance. Roswell, although seemingly large to newcomers, has changed little in size. I have travelled to Roswell since the late 60s and little has changed. I'm glad you liked it Cody. With all the biofuel savings, perhaps, the CNN bean counters can allow you to post a daily series of pictures, especially of the Rosewell aliens. I'm really not sure what the point of this blog is? Is it about an old truck that needs constant fixing, is it about the availability of biodisel, or is it about seeing cool places? I've been trying to figure out why I should keep following th blog, but I can't. I'm sure you'll get to the bottom line. If you were showing us that you were having fun then this blog would be quite boring. Let me know how to get more out of my vehicle other than 'inflating my tires.' I think you are doing a great job. Keep up the good work guys. Also, are you passing through Jackson? We'll be sure to have you guys a home cooked meal if you do. The online mapping services certainly are not going to calculate the time in which people need to eat, refuel, or do whatever they need to do. They just know that if it takes 8 hours to drive from A to B going "around" 60mph then that is the quote they're going to give you for the time. There is no possible way for them to calculate that. They're giving you an "at least" timeframe. I just wanted to comment on that. This blog is about interesting reporting. In 1976, Brock Yates was a reporter for Car and Driver. He took a Corvette up the Alcan Highway. A 1976 Corvette. Not the most technologically advanced car. The rear suspension did all kinds of weird things. The Alcan. The majority was not paved. It was mostly dirt and gravel. And the fiberglass Corvette rode low. Alaska. No one had a Corvette within 1000 miles. Let alone a dealership or parts-in-stock. There were all kinds of subjects that Brock wrote about on the trip. It was obviously not about the car. If he wanted just to write about the 'Vette, he would gone to a racetrack or drag strip. I believe this blog is about the adventure, and everything that you see and experience on the adventure. It's about the good people you meet. It's about two reporters that become Mechanics over a weekend. It's about doing something different and in a different way than anyone else has done it. If you want the homogenized, standard, whitewash reporting that we're all used to, then no, this is not the blog for you. If you want something that's fun to watch and some adventure... stay tuned. Stop pretending to be stupid. You can't convince me that you didn't know that the estimate was "driving time" or that is it reasonable to expect a web site to time during stops that varies greatly from person to person. Joe, from Cody's Kick off article: "Can biofuels solve America's oil crunch?" http://www.cnn.com/2008/TECH/07/25/roadtrips.biofuel.kickoff/index.html . It (was ) supposed to answer the above question. The answer is, of course, a big fat NO. So the entire thing has morphed into something entirely different, and I have no doubt that the spin meisters will come up with something to assure us that "with just a leetle more" perseverance, or magic, or something that the answer will be "Yes", but not right away. I agree Gene. Bio-fuels cannot "Solve America's Oil Crunch". But it is a small step, in a minor section, of a big problem. Bio-fuels can help, but they can't solve it all. But I also see that we're going to need wind, tidal, solar, bio-fuels, and regular old dino-gas to become independent and diversified. They new Energy Companies (not oil companies) can then compete with each other to give us a better product at lower prices. It's all about energy, not matter how it's produced. I'd be happy to drive an electric car to work if it makes more sense to my wallet. And I won't care if the energy came from solar or nuke or wind or from rats on exercise wheels. As long as it allows me the freedom to get around and it helps to reestablish the environment that I have to live in long after the baby boomers die off, then I don't care. Nic, I've mentioned this before, but the underlying fundamental issue is not the diversity of energy resources we can bring to bear. In this case diversity is a very bad thing indeed. It is "Standardization". Without standardization of the energy industry and total cradle to grave infrastructure at a level that is equivalent to that which we enjoy now, the result will be chaos. Different regions have different available resources, therefore you will have regional and incompatible delivery and technical standards for different regions based on whatever is locally available. Fossil fuel (oil, coal, ng ) is successful precisely because it is the world wide standard fuel. Think about the consequences of a dozen or more fundamentally different fuels. The costs of each go up, the usefulness goes down, vehicle and power manufacturers must build for local markets, trade suffers, etc., etc. We've had this standardization problem in many other industries for thousands of years, and every single time we standardize something civilization wins. I wouldn't want to go backwards on this at all. Without standardization, the Pyramids could not have been built. Since you're heading west get off the interstates, take the two laners, far more interesting than being stuck in a twenty truck convoy on Interstate 40 heading to Blythe. Slow down to 55, roll the windows down, forget speed. Try the 72 halfway from Phoenix to Blythe, takes you to Parker, AZ, then cross the river and take the 62 through the desert, no signs, no billboards, wide open nothing. When you get to Joshua Tree hang a left and go through the park, stop at the rocks, smile, and reconnect with the 62 towards Palm Springs. Then go past Palm Springs to the south and turn right on 74 to wind through the Idywilds and onto San Juan Capistrano on the Coast. Best two lane ride back from Phoenix you could ever find, I do it every sales trip, pure driving Zen. Good point. My idea of standardization is electricity. You can move electricity anywhere. We do it now. All the time. How we produce that electricity is just as you said, each region would have it's own production means. As for the fuels in vechicles, internal combustion is internal combustion. Flex fuel vechicles are being touted everywhere, but we only have two or maybe three types of fuels available and only in limited locations. Brazil has five or six types of fuel available at almost every station. The competition brings the prices down. You get different mileage for different types of fuel, but you can do the math on what is the best price/ fuel type/ fuel economy for your particular car. We're standardized now. Gasoline and Diesel. You are looking at it from a process standpoint, which works great and is cheap if everyone can have the fuel for the same price and everyone agrees with each other. But even though most left wingers want it to be, the world is not communist. Look at it from a realistic geo-political standpoint. Give OPEC some real competition. Give major coal producing countries (China) some competition. Prices will come down. This "all eggs in one basket" SNAFU has got to stop. I never use the driving time from Google maps, Mapquest or whatever other map web site is out there. They don't know my driving habits and they would never be correct. I go purely by the distance given and what roads I'll be driving on. A little more work than just reading off the driving time but a LOT more accurate. Gene said: Without standardization, the Pyramids could not have been built. Nic, you're not looking deep enough. Even electricity is not as standardized as you would think, in generation, transmission, or storage thereof. In any case the grid is not up to the task and won't be for the next half century. There is this thing called growth in population and standard of living to contend with, so we are constantly pursuing a receding horizon in terms of our ability to keep up with the need. And of course it's not all just about 9-5 commuters. It's also about food, water, soil, and every other natural resource we pull out of the ground. Don't be simple. The problem certainly isn't. Gene, you should tell that guy holding a gun to your head that you don't really want to read the blog. Maybe, just maybe, you won't have to read it since you find it so boring and all over the place. For goodness sakes...I've never stayed reading any blog that was one dimensional. I thought you were the one being simple with your "Standardization". Why are you flip-flopping? If we as humanity standardized everything, then we would never move forward...ever (See: "The fall of the Soviet Union"). The point that I made is that there is not a single solution. There are multiple answers to the multiple problems in multiple areas. There can be no "Standardization" across the board. Go look at what Iceland is doing about their energy. We can't do that everywhere, but it certainly works for them. There's not a cheap solution either. I'm getting tired of the baby boomer mentality that we need a quick, cheap fix. That always bites us in the T-cutter later. We never elect politicians on what their long term goals are. The major voting block (boomers) always think "How is it going to help me now?" and "To hell with whatever comes later." We as a nation have to look at the long term goals. 50 years ahead of what is going on now. 100 years. Competiton brings prices down. Communism ruins everything. As for electricity; the generation of it is different, I said that. Transmission is pretty standard already. Until we develop a superconductor that can operate at outside air temperatures, it probably won't change. The only eletricity I see getting stored is in batteries, and they are making improvments everyday. Although, I doubt if an electric company is ever going to store eletricity in a battery and ship it to your house. You should try and get your information from a variety of sources, and not just the Communist News Network. Then make your own educated thoughts and decisions. P.S. Joe, this is something else the blog does, it gets people talking so that we're not all automotons. If the folks of The Great Depression and WWII were the "Greatest Generation", then the Baby Bommers are The Greediest Generation. Many people today are looking for the *quick fix* and not worrying a bit about posterity. As it appears to me, today's younger generation see our appetite for fossil fuels as a sort of entitlement, one which they should be able to enjoy and a hunger they should be able to satisfy. This feeling of entitlement is part of the problem, not anywhere near part of the solution. The only way we're going to get ourselves out of this hole we've dug ourselves is to look objectively and realistically at every option and evaluate each one on its own merits. Right now, Ethanol is getting a bum rap too. I've read recently that if it were not for the millions of bushels of corn converted to ethanol, gasoline would be $0.45 more per gallon. This is just one way an alternative fuel is making a difference. Thanks for the interesting comments and I love to hear the spirited discussion. Cody and Brian, keep on Scoutin'! Nic, I'm talking about technical and business standards that are necessary for proper and functional integration of large scale systems. Such as those maintained and published by NIST, ANSI, and so on. Not some social or cultural political system. NOVA Biodiesel is a fifteen person coop planning to launch as soon as we are able to overcome some logistical challenges. We would very much like to host your crew in the DC area, our national capital, for a day. We could arrange for a press conference, fill up your tank, provide extra cubies of B100, a place to stay, internet connections and more. Please e-mail us if you have any questions! We estimate you would be arriving in the DC/Northern Virginia area in the August 9-16 timeframe, if you accept. Dieselscout, my apologies for generalizing. You're right. What I should have said was "most baby boomers". But you have to admit that the majority of the voting block does vote in a way that has a very short term view. The sense of entitlement is probably one of the largest personality issues that there is with a direct relationship to the energy problem. Everyone in all generations needs to see the issues in a different light and quit thinking only about themselves. You're 100% right and I agree totally. However, everyone should be afforded the freedom of movement in this country. It should not just be a thing for rich folks to do. If it was too expensive to move from one city to another, then we would end up with folks that have no chance of bettering themselves and therefore the nation by making a move. It would lead to less competition in areas on all scales. Your pool of eligible employees would shrink considerably. People would loose the power to choose what is best for them from housing to tires to food if the ability to transport goods become too expensive. Competition would grind to a halt and prices would go up. But to get to a point where we have affordable (not cheap), and competitive energy is going to take a costly first step to get our nation away from a fossil-fuel-only means of production. I'm happy to see that we are taking some of those first steps now. We should never stop, never be complacent about our energy situation. Even if the price of oil falls to $12.00 a barrel we should not stop developing different ways of producing energy. I'm glad that you brought up Ethanol. Although it gives us less BTU's per gallon and therefore reduced fuel economy, it's benefit of competiton/ lower demand has lowered the price of a barrel of oil. I'm happy to see road trips like the one Cody and Brian are on now and other stories highlighting alternative energy. They show us the pros and cons of the bio-fuels and other means eletrical generation. It helps to educate us so that we can make a personal decision on if we should switch to another method or not. We all have to make personal decisions like changing to a more expensive light bulb type to driving fewer miles, to car pooling, to recycling. Again, my apologies for generalizing. But please ask your fellow voters to make decisions for the long term. I'm doing just that with my generation. Your Scout is beautiful, Mike. Thanks for the video link. And Gene, I'm sure that the methods of power generation function will be standardized. But why get the cart before the horse? Cody and Bryan are still ROCKING.......Sounds like a lot of fun and an experience they will always remember........ROLL TIDE.........stay away from Ole Miss...............Tuscaloosa would be nice...............!!!!!!!!!!!!!!!!!!!!! "somebody else will do it", and thinking that it's all gonna turn out alright is unrealistic to say the least. I was involved in the standards setting business for 40 years in one capacity or another. If you've been on an airplane in the last 25 years you are effected by a few standards I wrote, or was otherwise involved in the approval thereof. We're not talking about color standards for the latest XBox case. We're talking about things that affect the lives of everyone. If people are serious about the future of this country, and energy to power and transport and generally give us the "good life", then we/they better get serious about this. Or it won't happen. While I credit Cody with an "awareness" article, I have serious concerns about just how serious people are, including the staff at CNN. You can do nearly anything as long as it's officially a "experiment", and doesn't endanger life, etc. But the second you start selling it to the general public, you better have your ducks lined up and quacking in unison. The consequences of not doing so, are unpleasant to say the least. If you want to have a say in the future, then you must be involved in the present. And that means being involved in Standards setting at a company/industry or gov't (including International ) level. Visit ANSI http://publicaa.ansi.org/sites/apdl/Documents/Forms/DispForm.aspx?ID=4947&RootFolder=%2fsites%2fapdl%2fDocuments%2fNews%20and%20Publications%2fBrochures&Source=http%3a%2f%2fpublicaa.ansi.org%2fsites%2fapdl%2fDocuments%2fNews%20and%20Publications%2fBrochures to see where the biofuel standards process stands at present. I think you might find it of interest. In particular the "Principles" section of the brochure. This is just to give you an idea of the complexity of getting the energy problem solved. It won't be solved by a bunch of hobbyist's in their garage. Even Bill Gates would agree with that. Why the IH scout? I drove an early 70s bright orange scout in the late 80s. I loved that vehicle, and trust me, it could go faster than 65 mph. Not safely, though. Scouts, like most SUVs, are notoriously top heavy, and aren't heavy, making them even more likely to tip or be unstable in high winds or at high speeds. All that said, not sure what this blog adds to the mix. Scouts get notoriously bad gas mileage (hey it was built in the 70s...). So, even on biodiesel, you are still burning a lot of fuel, which seems counter-intuitive and highlights the boon-doggle aspects of the trip. But what the hey, if you get to drive cross country with a friend and your employer pays for it, more power to you. Which oil company does Gene work for? Hi Cody & Brian, I'm really enjoying your blog and comments. I sure wish I was out there with you. What I want to do is make a crosscountry trip with a diesel-powered RV on biodiesel. Don't let the naysayers discourage you. I posted a message on eons.com in the RVing group about such a trip, titled Granny Goes Biodiesel. The ONLY positive comment I got was the link to your blog. I want to become a fulltime RVer, but the rising cost of fuel is putting a major crimp in the lifestyle of many people doing that. We need fresh insight into the fuel crisis. I've been doing a bit of research, and have decided that biodiesel is probably the way to go for now, because the cost of vehicle conversion is minimal up front, especially if you're aware ahead of time of the filter isues, etc. What you get is basically flexfuel capability between biodiesel and regular diesel, without the $40,000 or so to convert to natural gas, or whatever it costs to go to E85. I've researched fuel availability, and have found many places to buy it. Standardization issues have recently been resolved for biodiesel (see info on National Biodiesel Board site). Engine warranties are starting to catch up with research on engine maintenance cost using biodiesel. I'm looking forward to hearing about the rest of your trip. Thank you James R. I'd forgotten ASTM. There are so many people involved it's hard to keep track. ASTM is indeed a part of the overall process, and provides some valuable technical testing standards among other things, but is of course insufficient in and of itself. What I care about is that things work as they are designed to do, that they fulfill their advertised functions of performance, reliability, etc.. Standards ensure that there is a expected and required adherence to that end. I'm glad you recieved a kings accomadation for the night..you guys certainly deserved it for all you have been through. 🙂 . Maybe the next stop will offer you camping. So the trip isn't wasted by just neon lights, I hope you were able to hook up a lunch with the famous Roswell retired astronaut. I saw on the previous blog a good alternative car being offered is a VWJetta TDI for 23k...not bad......and affordable......any others out there? Give ideas. Sunny, the NBB is a trade association representing the biofuel industry. It is not a standards setting body, although they do provide input. As mentioned, they simply reference an existing ASTM testing standard, which in turn references other lower tier standards, etc. I don't really understand what the objection is that some people seem to have to participating in the International and National level standards setting process. It facilitates everything, including providing the consumer with known reliable performance, reducing trade barriers, managing costs, avoiding product liability suits, etc. Oh, well. Gene, Gene, Gene...you post comment after comment about how there are no standards, every other word in your posts are about standards and lack there of...yet I quote your last post "I’d forgotten ASTM"...what planet are you from? I don't know which oil company or pro petroleum company you work for (and of course you will deny this)...but you've done nothing but bad mouth biofuels or anything positive anyone posts here, saying how this blog is a waste of time...and then later you say "And, I actually do enjoy this blog"...what? Please move up the the golf ball size Prozac pills...Then stop posting one thing, and saying the exact opposite two posts later. Fuel can't be sold unless it meets a "STANDARD"! BioDiesel can't be sold unless it meets the ASTM 6751 standard. ASTM= American Society for Testing and Materials, is an international standards organization. So get off the BioDiesel doesn't have any standards rant...you've rode that one into the ground. The 2009 VW Jetta TDI starts at $23K, and it qualifys for a $1300 federal refund...so it will only be $700 more than the gas version. I don't think any will be as cheap as the Jetta TDI or as fuel effiecient. The fact is that every year, more city governments, federal government agencys, private companys are move to BioDiesel use. Diesel engines run better on BioDiesel than Petrol diesel....the diesel engine was made to run on peanut oil, BioDiesel is a variation of this basically. You don't have to take my word, do search's on the internet of all the city's switching all of their vehicles to BioDiesel use...not to mention it's use by the US Armed forces, private companys etc...The US NAVY is the biggest user of BioDiesel in the world...you think they would put something unsafe/untested in those million dollar ship engines...not a chance! BioDiesel is great! America is slowly waking up to what Canadians and Europeons have known (60% of all new vehicles in Europe are diesels, 70% of all new vehicles in France are diesels) for quite sometime...Diesel cars, and BioDiesel fuel are the way to go. VW is working on a car (they already have 10 built, and they're driving them around Germany on the Autobahns) to be released in 2010, I thinks it's called the 1L...it's name means it will go 100 kilometers on one liter of diesel/biodiesel...that's 235 mpg! It's going to cost $30K, and will be a plug-in diesel hybrid. How many of these do you think VW will be able to sell...? on right side, through a green light. Mix it up and your status is uinderground. Lack of standardization allows complexity and resiliency. Loss of biodiversity, starve, when the bug standardizes to our diet. If your car is multifuel, guzzler of any standard, empty tank and no cash. Take several buckets of used oil, from the alley, behind a restaurant. Standardization, to enable, for ease and simplicity, or victimization invitation ? James, if you do decide to attend or participate in any of these meetings, you should probably familiarize yourself with the recent history of biofuels standards activity. Here's an important document from an International task force formed to address biofuels, in which ASTM participated, as well as other National and International organizations. I think you will agree that there are a number of issues that remain unresolved on technical and other levels, ASTM D 6751 notwithstanding. I'm an aircraft inspector in real life. I think know a standard or two. I don't think that there will be several different companies brewing up new and exciting fuel and electrical processes in a barn behind their house that will never see the commercial light of day because they don't meet any of the standards. Why don't we start by making people think about fuel choices, then get companies convinced that there will be a demand, then worry about how their going to make the stuff? Franko. You're a nut and I love all your posts. You're like a crazed muppet running through a session of congress. Keep it up. Gene, I have a few friends that have had the same mileage numbers out of their VW diesels. They like to laugh at the gas hybrid owners for paying too much. Thanks for the info on them, I had no idea they were so affordable. Jerome - that's a great idea! I live near a place in Winchester, VA where I can get B100 - put me down for 20 gallons, which I'd be happy to chip in for this road-trip. How can we get in touch, do you guys have a website? Convenient conventions become standards, usefullness multiplied. Procrustes, (adjustible bed standard), further adjusted the guests, strech, or cut. Standards from the ruling group, or mass convenience defined ? When identical, happy ducks are US. Nic, the thing is that the standards process is on-going. Never stops. In the case of alternative fuels, the cart and the horse are well down the road already. All I'm saying is that if someone has a bright idea, or thinks the existing or proposed standards need changing he should get his idea in front of the people who can help him. If you're not involved in the process, you don't get a vote. Simple as that. Standards bodies are not there to somehow prevent the future. They are there to assist everyone, and anyone can participate. I think this idea that standards are a hindrance to innovation is a misconception on the part of many people. Quite the contrary: http://www.ansi.org/about_ansi/overview/overview.aspx?menuid=1 . To enhance both the global competitiveness of U.S. business and the U.S. quality of life by promoting and facilitating voluntary consensus standards and conformity assessment systems, and safeguarding their integrity. " There are two towns, Town A and Town B. 1% of each town wants to be able to drive from their town directly to the other. The one percenters ask their local government to build the road. The government says no, there are not enough people supporting that yet. This is where we are right now. 1. Educate people in both Town A and Town B how a road going direct to the opposite town would benefit them. 2. Gather up these folks and have them contact the local government and voice their opinion. 3. Show the government this large support and prove to them that there are benefits. Step 112 is survey where exactly the road is going to lie. Step 549 is figure out what the speed limit is going to be. Step 642 is figure out what road signs are needed. The above are the steps that you are trying to add now. Someone will develop the ways and means of building a new road. It's been done before all over. Each new road provides challenges. We will meet them when the time comes. Ever heard these other expressions? "You can't see the forest for the trees." "Every party needs a pooper... it must be you." "Convenient conventions become standards, usefullness multiplied. Ever hear of freedom of speech, Nic ol' chum? This is a public forum after all. In any case I'm sure you can do better than that. I've been heckled by the best. Get it all out. Then let's have an interesting conversation. Where do you want to start? Mathematics, symbolic logic, was thought, by some, to be a way to truth. From skilful definitions, limited, and need to define more, Axiom of Choice. The defining standards of the Pyramids, do not define a Stone Cathedral. Standards of terporary convenience, added to endlessly, newer catching reality. You could certainly see your expertise in the work you write. The sector hopes for even more passionate writers like you who are not afraid to say how they believe. All the time follow your heart. Hurricane forecasters: Who gets it right?